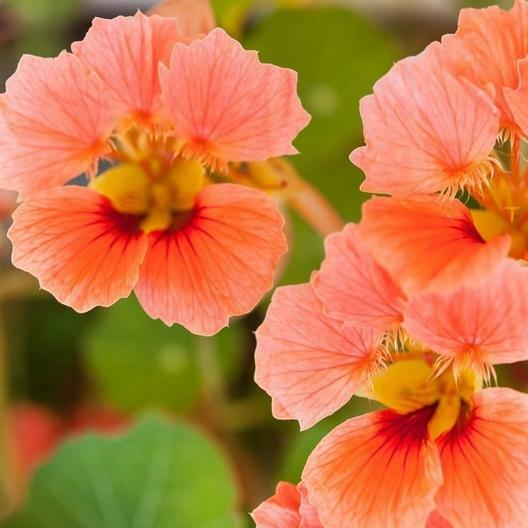 A beautiful garden bloom in a unique color, Vesuvius Nasturtiums bloom throughout the summer with big, Salmon colored flowers. Beautiful and beneficial, Nasturtiums are often planted as companions to vegetables as they can help to repel harmful pests. Oh and did we mention, they're edible? Add some flashy color and some peppery zing to salads with beautiful Nasturtium blooms. Be sure to soak your Nasturtium seeds overnight (about 12 hours) to help seedlings break through the tough outer shell.